The 30 Day Challenge. This is our second 30 Day Challenge. We are all about daily, practical action of simple skills to improve life. You can jump in on the 30 day Challenge at any time, or pick out one of the past challenges. For all of our lofty ambitions, best intentions and spiritual materialism, nothing really tests one’s spiritual practice quite like a trip to a big city Ikea on a Saturday afternoon. If Jesus lived today, he could avoid the 40 days of temptation in the desert in a single afternoon navigating the trials of his local blue and yellow building of human greed. It is a bottomless abyss of suffering that seems to bring out the worst in people (present company included). 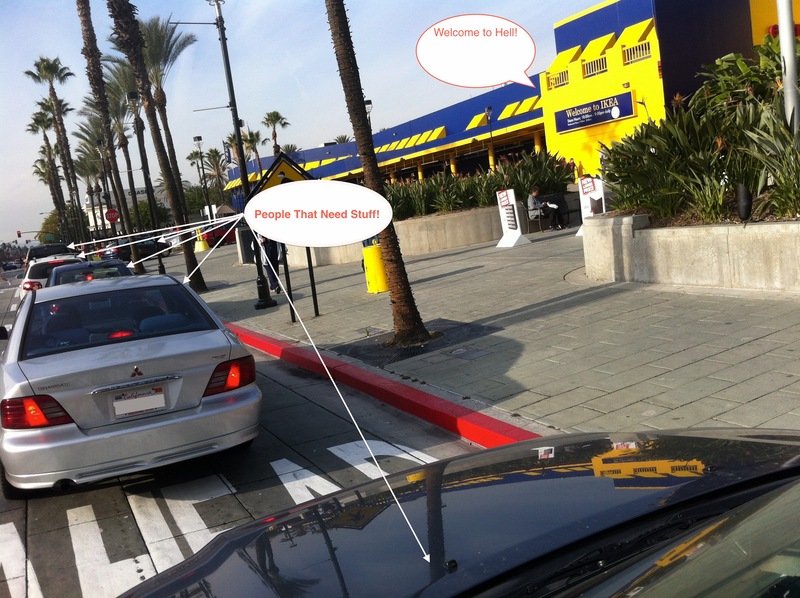 On a single trip to Ikea, people will cut you off repeatedly, push their shopping cart into your body, walk aimlessly into you, push a cart into your path, steal your parking spot and the list goes on. What is it about this place that creates a vortex of human dysfunction? Is it the traffic back up that starts a mile from the store? Is it the “Death Race 2000” kill or be killed parking lot? It’s hard to say. Just to be clear, I am aware that shopping environments like Ikea bring out the worst in people (Black Friday is a great example) and I have no judgment towards others (that’s to say, I try really, really, really hard not to) as I know that we are all doing the best we can with what we’ve got. What is even more odd is how all of that dysfunction dissipates as you walk through the door. It’s like Disneyland for adults. All of the faux rooms laid out with some version of a more ideal life than the one you have. A walk-through diorama with the solutions to what you think your current problem is, or more useless stuff then you’ll ever need. A wonder land of OMG, I CANNOT live without this grey fuzzy bathroom floor rug! But beware, the reality of your life comes crashing in from the first ReCon glance to find the shortest and fastest moving line. Once you near the cash register to ring out and reach for your wallet, the narcotic haze of consumerist over-stimulation starts to wear off. At Ikea, the nightmare doesn’t truly begin until you have to brave the “death race 2000” parking lot that could stand-in as a set piece for “Beyond The Thunderdome.” Just to escape the parking lot, you’ll have to fight your way through the throngs of overwhelmed and distracted pedestrians and motorists determined to advance one car length ahead of you at seemingly any cost. So here I am. So here you are. So here WE are. What to do? Well, this is why we call it a spiritual “practice” because it takes practice and apparently, using an Ikea shopping example, few of us are really any good at it in practical application. But this is where it counts. Right here, right now, at Ikea on a Saturday afternoon. The solution is to actually do the things that we pretend to do when we think of ourselves during meditation or on a Sunday morning at church. We can let the other car go ahead of us. We can drive slowly, deliberately and patiently in the parking lot. We can park in the last space available, even if it means walking an extra few yards, or down a flight of steps. This is where the quality of your life is improved, where serenity is actualized and the ability to be of service to strangers through acts of everyday kindness and patience is achieved. The zafu cushion and church pew kneelers will only take you so far. So here begins the Spiritual Aptitude Test (S.A.T. ); the ability to face life’s challenges with grace is the true measure of living well. You already know the alternative: Raised blood pressure. Anger. Agitation. Acting out at those loved ones or those closest to you. Allow Ikea to be your teacher (and not your adversary) as if going to a yoga class, meditation group, church, or twelve step recovery meeting. It’s Friday, so you can put this one in your pocket for the weekend! You may not have a local Ikea, maybe Costco or Sam’s Club could be your next best choice, or perhaps Dean & DeLuca on a Friday night? Whatever your options, any busy/or even not-so-busy public shopping environment will do. Choose an environment where people seem “in-it-for-themselves.” For the next 30 days, try to schedule your life so that you are not in a constant rush. If you are in a chronic rush, you will automatically become the self-seeking person who inadvertently, or intentionally, is hurtful to others and you will not give this 30 Day challenge a fair try. If you constantly feel panicked about time and have a sense of deprivation (an oh no, I don’t have what I need feeling), this will be a great opportunity for you for feel some serenity. Let the other cars go ahead of you. Drive slowly, deliberately and patiently in the parking lot. Park in the last space available, even if it means walking an extra few yards, or down a flight of steps. Give up the last available shopping cart. Deliberately, let AT LEAST one person go ahead of you in line. Last item on the shelf, with two of you there? Hand it over to the other shopper, or just walk away and let them have it. Tags: 30 day challenge, buddhism, Christianity, city life, Ikea, los angeles, mental health, self help, self improvement, shopping, spirituality, Stress Reduction. Bookmark the permalink. Can’t wait to see you in LA. Let’s go to Ikea! i never actually put myself in any of the above shopping situation. but i sometimes find myself going to Wal-Mart because it’s sometimes the only place i can get something within 80 miles. i’ll try it at Wal-Mart next time, even though i usually get a good laugh at Wal-Mart anyhow. Ha! Absolutely! WalMart can be be a great spiritual ground! Aha success!! That’s so fantastic that you gave the S.A.T. a try. Tough to pass up an awesome Kromer hat! Woah this blog is great i love reading your posts. Keep up the great work! You realize, a lot of people are looking round for this information, you can help them greatly.